JJ, Idris and Nhlanhla were having the time of their lives, dancing in character and miming the words to the music. The three have formed a bromance in the house, but have never had this much fun together. Perhaps now that their respective love interests have left the house, they decided to let go; or perhaps they were just having fun as a result of the housemates they had to impersonate. They danced in front of the mirror and played with all the bathroom paraphernalia they could get their hands on. Bottles were used as microphones and they even stuffed feminine hygiene products up their noses. A real sweat was worked up by all three, even prompting Nhlanhla to pull off his shirt, but their energy was boundless as each new song was just another reason to carry on dancing. They enjoyed it so much, that they even continued dancing in the shower. Sipe, Butterphly and M'am Bea whipped up a delicious-looking meal and were hard at work cleaning the suspicious mess on the fridge door. The beat got the better of Macky2 and Tayo as well. They were taking it easy in the garden but could not resist swaying their shoulders to the music, and Tayo was soon back on his feet. What did you think of all the dancing in the house? Botswana vote 4 Tayo remember he promise 2 marry Sheilla after BBA. Nigeria keep dreaming u don't have our votes not after the way you insulted our girl. Calling her dirty and old. Your boy truly hurt her with such insults. Vote Idriss. deserves the money. Do dey think dey are funny sorry is too for dem childish play trying to imitate Tayo with his funning jokes and dramatical crazy drama,RIDE on Tayo U've been destiny to win d Molla. Idris for the money..idris for the money.. They definitely entertain us just like Tayo entertaining u with his stupid noisy drum .they have been doing this for long, is just that uve been turning a blind eye, so pls just lobby for ur rep and leave our reps alone. Do dey think lt's funny? Is too late 4 them dey can nt convince us dey are bunch of dull pple trying to be active at die minute,our vote is for TAYO. 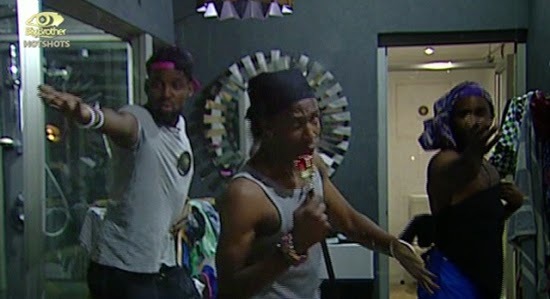 Why is that every comment from tayo's fans they are always insulting this housemate or the other. Can't u guys just leave other countries alone and just concentrate on tayo. Nobody hate him as much as u guys hate others. ATTENTION PLEASE!! !BBA MGT pls next year we don't want under18-24yrs,dey contributed nothing to dis year programme dia should be age screening,FANS pls let vote for mature HM imaging teenagers winning big molla U knw what will happen with d money. He has laughed and he has cried, he has shouted, even in his sleep, and he has been mute, he has been abusive and he has been apologetic, he has been funny with series of one-liner jokes and he has been the most talked about housemate - which I believe what big brother is all about. The man is TAYO! We r fed up wiz zis creature called Tayo. Insult almost every HMs from Macky2, Samantha, Miss P, Sheilla zen Idris. What is wrong with u guy. Tayo is too old for this game. Did someone say these guys are interesting?Uugh I turn my tlly off everytime they show ,It is rathr too late.They are not my idea of Funny ,annoying? Maybe. I keep on changing the channel when the cry baby shows his face. May be crying is entertainment in their country they must admit he only entertains them and not Africa. HUSH!! ...... JUST KEEP VOTING FOR TAYO! !